Suitable for students in middle primary. Discover a world of music through your ears! 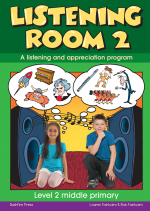 This fantastic resource includes 10 lessons in listening and appreciation for middle primary. It includes lesson plans, audio, charts, guided imagery, videos and outcomes tracking resources. A robot called Dvorak from Planet Sibelius takes the students on a journey through time, as they are introduced to simple concepts of structure, with movement, simple percussion scores, program music, instrument identification and fun quizzes.